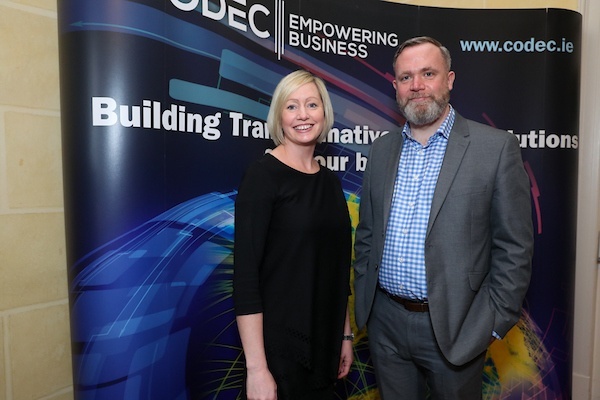 Speaking at Codec’s 2017 Microsoft Event, Aisling Curtis began her presentation with a bold statement – the Commercial Director for Microsoft Ireland announced that Microsoft’s mission is to empower every person and organisation in the planet to achieve more. And how might Microsoft’s grand ambitions be realised – the answer in a word (or two) is digital transformation according to Curtis. Citing the example of MyTaxi (formerly Halo) she said that the taxi booking app had secured 80% of market share within just two years by disrupting the industry to such an extent that customers felt compelled to use the service. It was stressed that digital transformation is not just about using new technologies, but more fundamentally about leveraging available technologies based on real customer insights. In other words what is possible now, in terms of delivering value, convenience and quality of service to customers or clients is far beyond what was conceivable just a few short years ago, and if your business is not changing to reflect the evolving and ever-changing technological developments out there then you could well be left behind. Curtis went on to refer to an IBEC study that estimated the value of digital transformation to be as much as €21.3 billion by 2020. Furthermore, the research revealed that €4.5 billion in potential revenue to Irish businesses is lost to non-Irish websites simply because the digital economy here is being disrupted. The message was clear – eat or be eaten, prepare or prepare to fail, be ready to disrupt or get disrupted by someone else. On the detail of the digital transformation journey itself, Curtis pointed to surveys carried out by Harvard and Amarach Research (Irish Market Research Company), which laid bare the uncertainly among decision-makers and stakeholders with 25% unsure what technology to use, and a further 30% simply unaware of what their specific business need was. Curtis said that a detailed change management program was essential in terms of managing the transition, and that it was vital that the transformation was carried out in a timely fashion. She said that failed transformations tend to implement the new platform but don’t take into account user adoption rates and the particular business requirements from the internal organization. Note: Codec will be providing bespoke change management templates to partners from 2018 in an effort to prepare Irish organizations for the massive undertaking in moving their business more fully into the digital sphere.